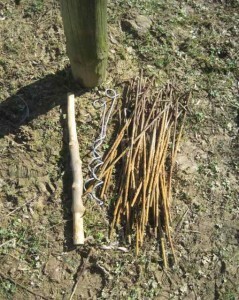 Essential for any hop viniculture venture is a framework for the vines, or more correctly hop bines, to climb up and framework sturdy enough not to blow over as harvest nears when the vines are at the heaviest. I like to think that hops and hop viniculture are to the UK what grapes and grape viniculture are to the French. I may be biased of course, but with beer there is an infinite combination of malts, hop varieties, yeast and water to challenge and keep any brewer or drinker fascinated for years. With some excellent new beers and up and coming micro breweries this complexity and diversity of flavours is to be celebrated. The Three Leg Brewery used local artist Jo Waterhouse for their art work, whilst The High Weald Brewery used Studio Parr for their equally amazing label creations. Rach Smith in her beer blog takes a look at Sussex Bottled Beers which again reviews some interesting labels, in addition to the contents of course! Among her beer selection, this post also includes the two above breweries. Meanwhile back at the ranch, this has certainly been a first, and not to be recommended, completely unconventional hop garden extension. 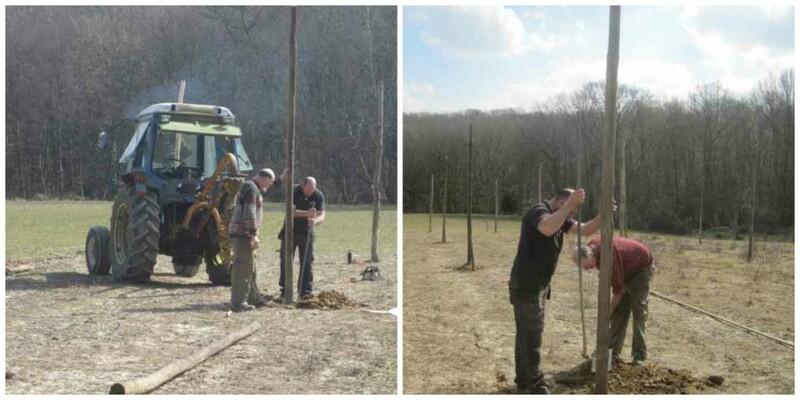 The hop setts were planted first, well before any sign of this hop vinicultural framework making its appearance! However, I am so pleased that the setts were planted when they were, these recent rains will have bedded them in nicely before the ground dries this summer. The cause for the delay was the exceptionally wet ground for the whole of this winter. 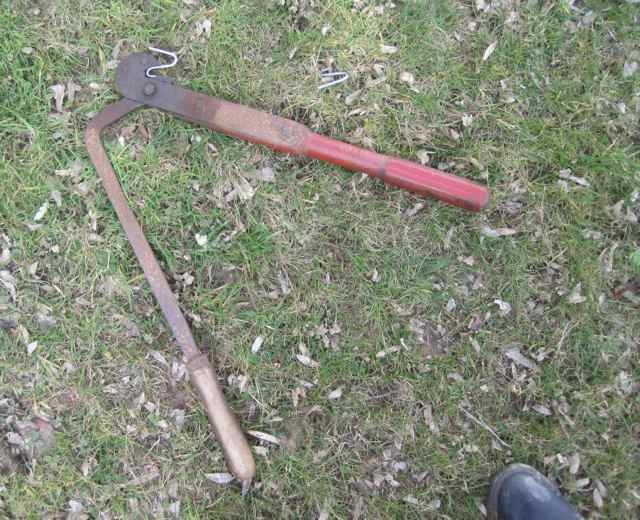 We normally get a spell of cold weather which freezes the ground hard enough to allow you to get onto the land for this sort of winter job without doing any damage. As soon as the ground was dry enough to get the tractor on the garden without causing any ruts, the poles were augured in, top wires put up and anchors attached. Phew, a great relief. Hurray and three cheers but only just in the nick of time as the hops are beginning to shoot. Hooks were put on these top wires this week to finalise the job and now it is all ready set for stringing, I like to leave this as long as possible in this garden as the deer will walk through, often breaking the strings which is a constant nuisance, hence the reason I am not in a rush to get this done. There’s not much movement yet, but you can ‘hear’ the hop plants readying themselves on their starting blocks for their annual dash up the strings. But as with most things there is a balance to achieve. A priority is that I like to get the first young bine, especially from any young hop setts, up onto the strings. This is in case any rabbits come along, they are less likely to nibble these vulnerable and probably tasty shoots once they are going up the strings. Later on rabbits can be a nuisance by occasionally biting the strings through along with the mature hop bine for no apparent reason. Perhaps rabbits need to sharpen their teeth?? Whatever the reason, it is a pain, they just bite the stems and strings but don’t eat them, the result is that hop dies back, such a waste. Another outstanding job before stringing and before the ground dries up, was to replace some screw pegs. 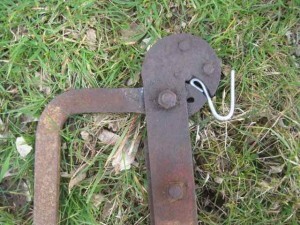 This type of peg has not been successful. 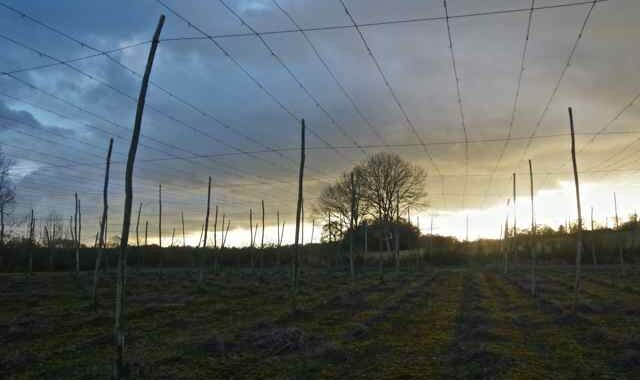 When the hops were up the strings once the wind blew they turned upside down allowing the strings to come off. This is more sensitive in the Sussex Zig Zag system so they needed to be replaced for this year. Luckily only two rows had them and now all have the ‘proper’ spiral screw pegs in situ.